Saturday February 10th 1883 It was ten oclock when we got through breakfast. Charlie and Mother went to the valley and I had my hands full to get the house in any kind of order and get the dinner. May Lathrop spent the day here. Hatt was over a while in the afternoon and Kate went over there before she started home on the afternoon train. Chas did not come over home again but went on the same train with Kate. I was over to Folsoms late in the afternoon. We all went to bed early tonight. 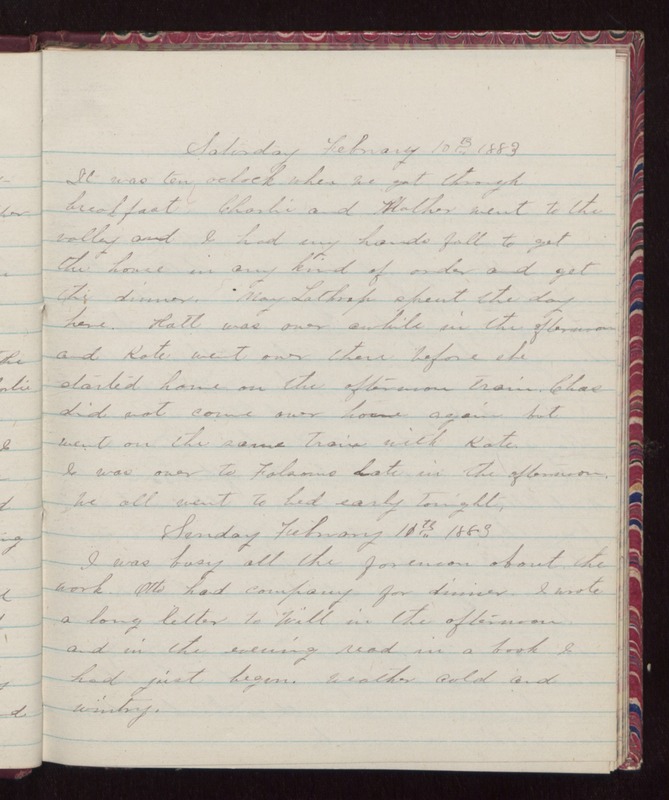 Sunday February 11th 1883 I was busy all the forenoon about the work. Otto had company for dinner. I wrote a long letter to Will in the afternoon and in the evening read in a book I had just begun. Weather cold and wintry.